Yes, yes. 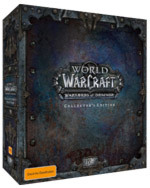 I pre-ordered the Warlords of Draenor Collector's Edition. I have all the past collector editions including the one for original "vanilla" WoW so why stop now. I don't put as much time into the game anymore but I'm just a pathetic completist I guess. At least you get this cool card back for Hearthstone too.